COVER RECORDS - In 1959, Buddy Black Cunningham Sr. started his own record label, Cover Records, located at Stratton-Warren Hardware Building, 110 East Calhoun in Memphis, assisted by his son Blake Baker, who became a jack of all trades for the label, singer, songwriter, session player, producer and general handyman. One of the first records on Cover Records was B.B. 's "Trip To Bandstand" b/w ''Electrode'' (Cover 5931), an obvious cash-in on Bill Parsons's "All American Boy". Credited to simply "B-B", it was one of the few vocal Cover releases by Cunningham Jr., who had six 45s issued on his father's label between early 1959 and 1962. Of the instrumental tracks, the one of the best is "Ivory Marbles", a pleasant piano rocker backed by ''Sea Fever'', which has been reissued on several compilations. "Beale Street Twist" b/w ''Hip Pocket Twist'' (Cover 4622, 1962) was credited to Lyn Vernon. By 1962, Cunningham Jr. had taken over the running of the label from his father. During its 7-year lifespan, Cover Records issued rock and roll, rockabilly, rhythm and blues, jazz and straight pop, virtually all by local Memphis artists. A nice overview of the label's output can be found on the CD "Hot Rockin' Music - From Memphis: The Cover Recording Company Story", issued by Dave Travis in 2000 (Stomper Time STCD 10). It includes 13 tracks by B.B. Junior, that is. Probably the best known Cover release is "Ain't That A Dilly" by Marlon Grisham, which is available on countless compilations. SUPREME RECORDS - A division of Cover Records, Memphis, Tennessee. BUDDY BLAKE CUNNINGHAM - Originally born in 1919 and raised in Jackson, Mississippi, Buddy Blake Cunningham had a career as a minor league pitcher to concentrate on singing. Instead he pitched himself as a vocalist, albeit in the style of forties' crooner, Rus Morgan. Using a song from Lew Douglas, an arranger who had once worked with Tommy Dorsey in his hometown of Chicago, Cunningham cut his own master and sold tapes to Sun. In July 1954 he was living in Memphis very close to Sam Phillips, and he was the closest thing to a star on the Sun roster that month too. His Valley recording of "Angels In The Sky", which, like this record, was also directed by Cliff Parman had been a good regional seller earlier in 1954. 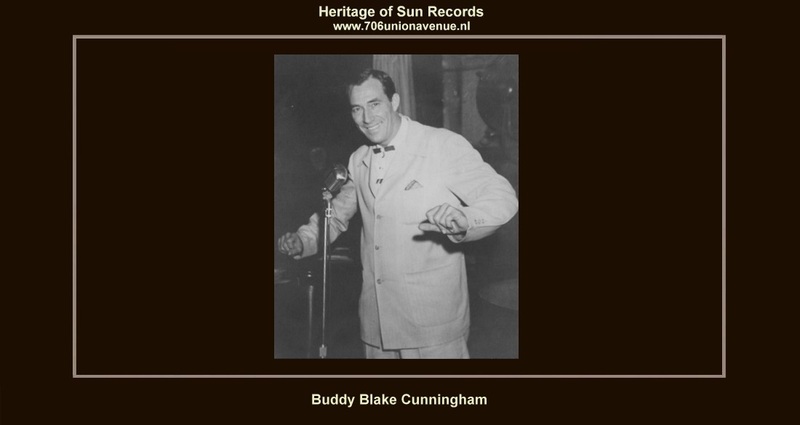 The first Phillips International release extended the Sun career of Buddy Blake Cunningham. Blake had been last heard from three years earlier on Sun 208, a record most collectors remember with a shudder. The deservedly rare "Right Or Wrong" b/w "Why Do I Cry" makes most short lists for the least favorite and most anomalous early Sun release. For whatever reason, Blake's style held considerable appeal for Sam Phillips, who worked overtime with the local singer, scheduling sessions at 706 Union in March, April, May and June 1957. Blake left more that a dozen unissued sides from these dates which a quarter of a century of Sun archaeologists have never deemed worthy of resurrection. "Right Or Wrongly", Buddy Blake has never been the poster boy for Sun record collectors. Still, Sam Phillips gave Buddy a second kick at the can on Phillips International in 1957, and Buddy's son, B.B., went on to become a luminary in the local scene as a member of the Hombress. Buddy himself went on to start a collection agency which may have repo'd the automobiles of several members of the Sun rooster. After his final session at 706 Union, the by now well-versed Blake departed to set up his own Cover Records operation in Memphis from the downtown Exchange Building in 1959. Assisted by his son Blake Baker, who became a jack of all trades for the label: singer, songwriter, session player, producer and general handyman. One of the first records on Cover was B.B. 's "Trip To Band Stand" (Cover 5931), an obvious cash-in on Bill Parsons's "All American Boy". Credited to simply "B-B", it was one of the few vocal Cover releases by Cunningham Jr., who had six 45s issued on his father's label between early 1959 and 1962. Of the instrumental tracks, the one is like the best is "Ivory Marbles", a pleasant piano rocker, which has been reissued on several compilations. "Beale Street Twist" (Cover 4622, 1962) was credited to Lyn Vernon. By 1962, Cunningham Jr. had taken over the running of the label from his father after his death in 2000. During its 7-year lifespan, Cover Records issued rock and roll, rockabilly, rhythm and blues, jazz and straight pop, virtually all by local Memphis artists. A nice overview of the label's output can be found on the CD "Hot Rockin' Music - From Memphis: The Cover Recording Company Story", issued by Dave Travis in 2000 (Stomper Time STCD 10). It includes 13 tracks by B.B. (Junior, that is.) Probably the best known Cover release is "Ain't That A Dilly" by Marlon Grisham, which is available on countless compilations.